Lunar New Year is a vibrant cultural holiday that commemorates the beginning of a new Asian calendar in late January or early February every year. It is also known as the Spring Festival or the Chinese New Year. This 15-day festivity is observed with a variety of traditions, including thoroughly cleaning the house to bring good luck and exchanging red money envelopes to encourage prosperity – it is a time to welcome new beginnings, fortune and well-being. In 2019, we mark the Year of the Pig. It is said that this animal embodies affability, camaraderie and affluence. These are important characteristics that can help guide each of us toward having an enriching year ahead. For all citizens, Lunar New Year is an opportunity to reflect on the enduring city-building contributions the Asian-Canadian community continues to make as accomplished entrepreneurs, celebrated performing artists, renowned academics, dedicated public servants and compassionate neighbours. 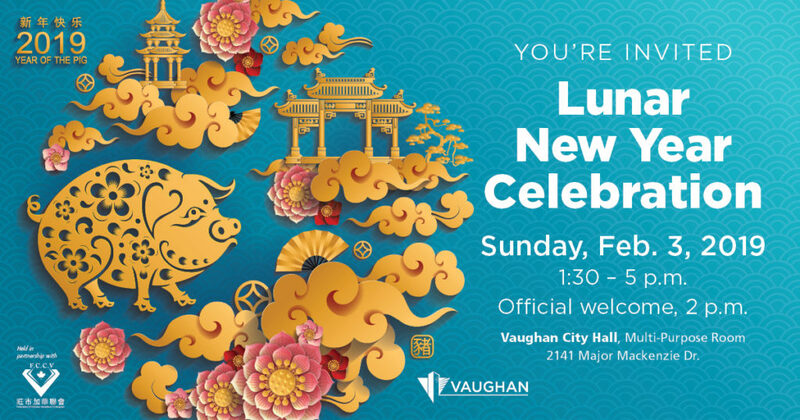 We invite residents and guests to usher in the Lunar New Year at Vaughan City Hall on Sunday, Feb. 3 from 1:30 p.m. to 5 p.m., with an official welcome at 2 p.m. Join the community in welcoming the Year of the Pig and celebrate the various customs and backgrounds that make up Vaughan’s vibrant diversity. Festivities will include a traditional lion dance, an eye-dotting ceremony and a visit from the God of Fortune. There will also be stage entertainment, including musical performances, cultural dances, a cooking demonstration and a magic show. Children can have fun with games, colouring activities, Chinese calligraphy and button making. This year, the event is organized in partnership with the Federation of Chinese Canadians in Vaughan (FCCV) and the Markham Richmond Hill Vaughan Chinese Business Association (MRVCBA). I would also like to thank all our event sponsors, Castlepoint Investments, Liberty Development, Remington Group and Zzen Group, our entertainment sponsors, Vogue Development Group, Miller Thomson LLP and the Justin Poy Agency, and our food sponsor, Paradise Banquet and Convention Centre. ← Communications Focus Group – We want to hear from you!